“Totally Not a Cat” alerted me to the fact that an EarthBound Zero prototype cartridge is currently up for auction. After some quick fact-checking and cross-checking, it looks pretty likely that this is legit. I think there are only three known prototypes circulating in the public, and there’s at least one inside NOA that we know about. I really should write some kind of article or reference page listing all known legitimate proto cartridges, info about them, info about fakes, etc. I think it’d be interesting and useful. If anyone has any useful info/links concerning that, let me know. Anyway, it’s probably for certain that some crazed rare-game collector will end up snatching this prototype, but it should be fun to watch the bidding war that’s set to ensue in those last 20 seconds 😛 The auction ends on the 28th of this month, so this should be a neat show to watch. How are these carts able to be verified as real? Usually by the circuit boards and other official things associated with prototypes. This specific one has turned up before and sometimes we can follow ownership of them over time. WHOLLY CARP!!! I never thought another one would pop up! So how do we know what the circuit board on the inside looks like? Or is it known by that specific sticker on the cartridge? The person who had it last is reputable (the same guy mentioned in this auction) and the proto he had looked exactly like that. I actually didn’t pay much attention the last time this proto was put up for auction, but other people on the sm.net staff recognize it and did some checking up on it. I don’t know the details, but it sounds pretty legit from what they say. I say “pretty” because even though the info matches and the label matches and everything else matches, there’s no way to know for super sure. The last time this was put up for auction was a year or two ago so the imageshack pics don’t work anymore, but Google does have thumbnails left. See here. This jollerancher guy that’s mentioned was a prototype collector but sold off most of his collection a while back. I guess this current auction guy couldn’t sell it for $2000 last year and is trying again. … This is an honest, curious question… NO burn on legitimacy intended… how did a NOA proto cart wind up in the Netherlands? That just where the last buyer is? Also, where are all these proto carts coming from? How many usually get shipped around for one game? I only knew of the one being sent up here to Canada for our bilingual shenanigans. Hmm…I saw this a few days back and dismissed it. 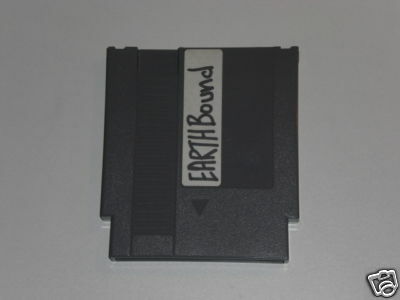 I could be wrong, but it doesn’t seem to have any internal address labels or anything, and the title “EARTHBound” seems a bit odd, unless whoever got it added it after the fact. I dunno, I don’t fallow it too close. I may be mistaken, but doesn’t the prototype make the game unable to be completed due to a copy-protection mechanism? If so, I think I’ll stick to the ROM. A prototype would be cool to have, but if you can’t play with, then the fun value goes down. Yeah I can’t wait to see what’ll happen in those last few seconds of bidding. Especially for something like this. I doubt that it’s legit. The guy just probably moded the Earthbound Zero hack/translation to make it seem real. Alot of people are doing this. And why would you want to pay zillions of dollars for something that you can download off the net for free? I don’t know. 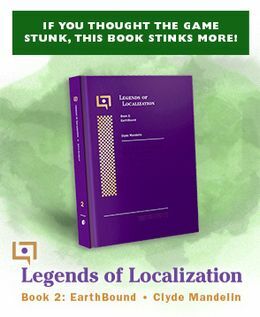 The fact that it has EarthBound written in sharpie on makes me think “fake”. Spitball Sparky: No, the protos are fully playable. The copy protection stuff only happens when the game realizes that game’s data has been modified. One of the owners of the first known cart played through the entire thing, see here. Well, without having done research or tried to track where that particular cart has been, it’s kind of hard to pass judgement based on a label that could have been added once it was purchased by someone and verified as a legit leaked cart, no? I’d go off of what Mato’s seen, he generally has a good background with EB stuff and has seen this before. Maybe someone else who saw the cart when its last owner sold it could verify its legitimacy based on what had been seen of it before? Yeah, if someone’s seriously going to spend that much money, they shouldn’t rely on me and vague memory and such, they should ask the seller tons of questions first. If I were the seller I would go to greater lengths to prove that this cart was 100% authentic right on the ebay page. To me it looks legit – he has over 700 reputation points. I doubt someone with such a high score would ruin that reputation. I wouldn’t buy it even if I had the money, no SNES, or Super Famicom for that matter. I’m putting my money on Bidder Four. He’s got balls. For those who haven’t been watching, he did post pics of the inside circuit board. It sold for £860/$1000+. A new bidder came in and won it right at the end.